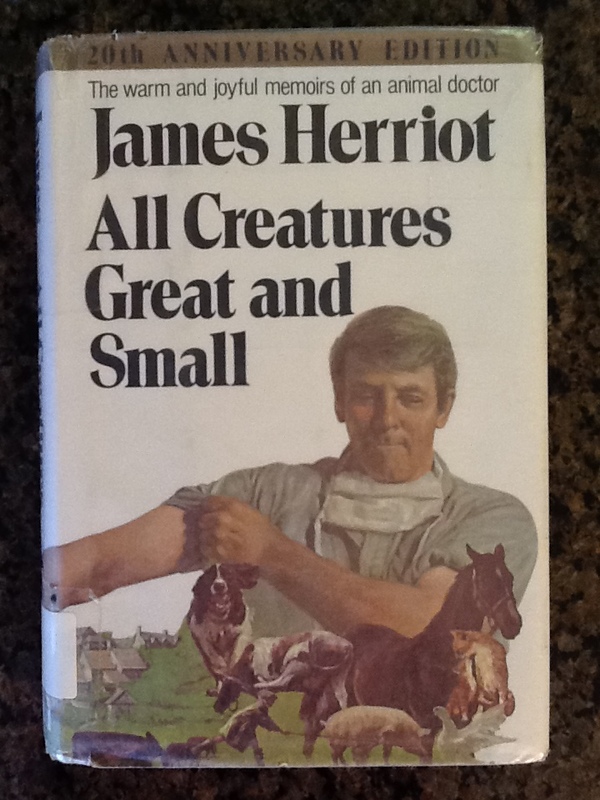 Veterinary Memoirs: All Creatures Great and Small – The Bookshelf of Emily J.
James Herriot plays uncle to a rich dog in All Creatures Great and Small (1972). It is just one of the funny situations Herriot faces as a new veterinarian in the English countryside. Tricky is a small Pekingese dog spoiled by rich widow, Mrs. Pumphrey. When Herriot visits frequently to help Tricky by squeezing the puss from his infected bottom, his owner begins sending Herriot letters and invitations and gifts in Tricky’s name. The “trick” is for Herriot to respond to the dog, not Mrs. Pumphrey. Of course, he is teased by his employer Siegfried Farnon, who runs the country practice for which Herriot works. The two, along with Siegfried’s brother Tristan (their father liked Wagner) attend to the town’s animals. There is no overarching plot, but the book is instead a collection of Herriot’s memories of his first year as a veterinary surgeon and the many lessons he learned. Herriot’s real name is James Alfred Wight. The book is his memoir. I remember the book being a staple on the bookshelves of my childhood home. I have a sense that it must’ve been popular in the 1970s, for it often graces the shelves of vintage bookstores and thrift shops in the dozens. I know there are sequels, which I have not read, but I am sure they a just as enjoyable and entertaining. I first read the memoir as a junior high school student because of that paperback copy in my home. I remember enjoying it immensely, but as I recently reread it, I wonder how I enjoyed it so much. I am sure I did not understand most of it, especially the birds and the bees parts. There is also some harsh language and grown up humor. But I have great memories of having read it then. Those memories are mostly of the feelings I have toward the book, for the stories were completely unfamiliar to me. I enjoyed rereading and feeling as if I had met this book for the first time. It begins with Herriot describing his arm inside of a cow. It is a gripping scene and a great narrative hook. Who doesn’t want to know more about what will happen? This scene replays itself in different forms many times throughout the book, for Herriot is always fixing cows and other animals in labor, whether that means putting a uterus back inside or turning a calf or a pig so it can continue to descend during birth. The other fun scenes involve Herriot being kicked or attacked by the animals. This part of being a veterinarian is probably what I would not be capable of handling. If I’m being honest, I am afraid of animals. I think some of them are beautiful, but I feel that I cannot ever know their thoughts, feelings, or temperament; therefore, I cannot trust them. This leads to fear. I am also afraid of their saliva on my skin and that dirty feeling on my hands after stroking their coats. I am somewhat picky about having clean hands, so veterinary work is not for me. However, I got to live it vicariously through All Creatures Great and Small. The other part that I love is the title. It is from the hymn “All Things Bright and Beautiful,” but it reminds me of another favorite hymn, written by St. Francis of Assisi, “All Creatures of Our God and King.” The words are beautiful and poetic. And the music is divine and inspiring. I sometimes play it on the organ for my church’s congregation, and I am filled with joy whenever I hear the refrain, Alleluia. The melody makes those words mean more. It really is a fitting title for a veterinarian’s memoir. I am glad I revisited it. How Many Oprah Books Have You Read? Wasn’t there a television series or miniseries made of this? I think I remember my grandmother watching a show with a vet and a Mrs. Pumphrey who owned a foofy dog. Yes, there was a television series. It is actually on Netflix right now, and we tried to watch it, but it is so old it just doesn’t compare to the action or camera angles of say 24 or Grey’s Anatomy or Luther. I love Aunt Ada Doom and take her name in hopes that I can be so cool when I’m eleventy million years old. Ha! I am sure you are already that cool. Just don’t wait until you are that old to leave the house and visit Paris! Is that where you are from? Cut me in half and there you will find the white rose! You? As a child every Sunday evening was spent watching the successive series of ‘All Creatures Great and Small’ which were a staple of British television for many years. I think I did read the books but it is the visions of Christopher Timothy, Robert Hardy and Peter Davison that immediately come to mind when you mention the title. I then had the great pleasure of living in what is now known as Herriot Country for three years and I have to say that the picture he draws is extremely accurate. That is so neat. And how funny that the depiction is accurate. I loved all of the “country” ways of describing the animals ailments. How cool! Oh, how I’ve romanticized the moors over the years! It really is a great book and I am glad to know I wasn’t the only one reading it so young. I started reading these when I was about 10 – I found them in my parents’ bookshelves and just devoured them. I’ve read them enough that I’ve practically memorized them all. I was never interested in being a vet – especially after reading all he goes through – but I found the food and eating aspect of his writing interesting. He’s always writing rhapsodically about meals. I’m hungry after reading Herriot’s books. He was a foodie before the term existed! For another animal/humour/food combination, have you read Gerald Durrell’s My Family and Other Animals books about his childhood in Greece in the 1930s? I haven’t read Durrell, but it sounds good. You’re right that Herriot was a foodie. I loved his description of the ball at Tricky’s. The James Herriot books as we still refer to them are still among the best stories I’ve ever read. I recently stumbled across the mini series that BBC made in the 70s. It is on Netflix and is just as wonderful as the books. Check it out. I love the stories and am addicted to the TV series. I agree that the cinematography is dated, but for me, the show is more about the dynamics between Herriot, the Farnons, and the various colourful locals who populate the countryside. Thanks for posting a review of it here – I think Yorkshire is just about perfect, and it’s nice to see it featured on your blog. It is a neat place! You are right that the show is about the relationships, but I guess since I’d already read all of it, it seemed identical and redundant for me to watch. I bet my husband would like it though. What memories your review brings back. I grew up on a small diary farm in Yorkshire and my father bought this book after reading a review in ‘Farmer’s Weekly’ magazine.The whole family read it and loved it. How neat! Your upbringing sounds really cool. I sometimes wish I’d spent more time on a farm. I’m terrible. The books were on the shelf, but I watched the show. Peter Davison was (ok, is) so wonderful. I grew up with that show and still get a little thrill when I hear the theme music. However, I never took the time to read. Maybe I should. You should read them, but from what I have seen from the show (which isn’t much), it follows the books pretty closely.